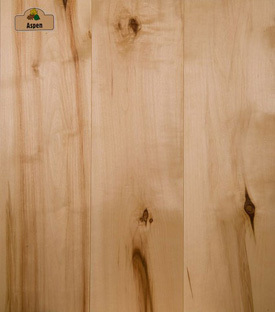 Aspen Poplar | aka: Aspen, European black poplar, Canadian poplar, balsam poplar, cottonwood Growth: Throughout N. America, Europe, and Asia. Appearance: Generally straight grained and "woolly" with a fine, even texture. Creamy-white to pale brown heartwood and sapwood. Physical Props: Most species are typically soft and light with low ratings for strength, stiffness, shock resistance, decay resistance, and steam bending. Working Props: Works easily with hand or machine tools but sharp edges recommended. Glues, screws and nails well. Staining can be patchy but paints and varnish are easily applied. Uses: Used for furniture framing, interior joinery, toys, turnery, matches, crates, boxes, pallets, packing, plywood core stock, veneer, and pulpwood.